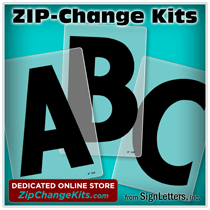 The Injection Molded Plastic Sign Letter styles shown in the listing below are available with the corresponding lowercase letters for each style. Many injection molded plastic letter styles will only be available in a few sizes and many will be offered in ALL CAPS. As more molds are created over the years to come, we will offer more styles to fill the actual needs of the industry. If you don't find the style and size combination you are needing in our Minnesota injection molded sign letters, please give us a call to see if we can assist you in your selection and you may also want to check out our formed plastic sign letters selection. Formed plastic letters will not have the same "sharp" sides of a Minnesota Brand injection molded plastic letter.